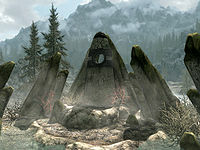 The Atronach Stone is one of the thirteen Standing Stones scattered across Skyrim. The stone adds a passive power that increases magicka by 50 points and adds 50% spell absorption, but decreases magicka regeneration by 50%. "Those under the sign of The Atronach absorb a portion of incoming spell damage and have a larger pool of Magicka, but recover it more slowly." The stone is located almost due south of Bonestrewn Crest, east-northeast of Darkwater Crossing in the southern-most part of the hot springs. It is found at the top of a mound with several other stones jutting out at an angle around it, surrounded by roiling volcanic pools. At its base is a steaming, shallow pool where a couple of jazbay grape plants are growing. Other nearby vegetation that can be harvested include some dragon's tongue plants and creep clusters. One corundum ore vein is located northeast of the Atronach Stone. Just east of the Atronach Stone is a waterlogged ruin. A skeleton is sitting in a chair and will attack if you approach. With the Shadowrend Creation installed, a mysterious dark geyser pool can also be found to the northeast. It is the location of Shadowrend, and you can use this geyser to switch between the two versions of the weapon after you complete the related quest. With enough Magicka regeneration buffs this Stone's penalty is minimal, considering that Magicka regeneration is additive and also influenced by total Magicka. If your character's total Magicka is low and Magicka regeneration high, this Stone might actually increase your Magicka regeneration. The Spell Absorb effect also has a chance of absorbing incoming diseases. This is because diseases are a magical effect. Because of this, the Atronach stone also provides a 50% immunity to disease. You can take advantage of the fact that the game uses magic effects for otherwise mundane items to recharge your magicka. Jumping up and down on a forge, for instance, will provide a small but noticeable boost to magicka regeneration. 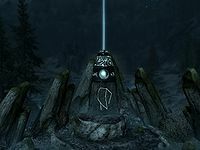 If the player has chosen the Aetherial Crown during Lost to the Ages, this can be combined with the Apprentice Stone to achieve 50% absorb spells, +50 magicka and 50% magicka. These bonuses are extremely potent on an Altmer or Breton, but also useful on other races.